This new edition to the Turnaround collection delivers not only amazing hydration, but also gives you a natural-looking glow sans oil. That’s right— that dewy look you thought was only possible with a little face oil is achievable with a little dollop of this oil-free moisturizer each morning. You have a choice of Rosy Glow, which will give you a bit of a sun-kissed radiance, or Golden Glow, which results in a more luminous skin finish. This moisturizer has a different texture then most you’re probably used to. The almost gel-like formula delivers 24-hour hydration, with about 2 million moisture-releasing aquaspheres in each and every jar. Another great perk, upon application, the sorbet instantly cool against your skin. The best-selling Rose Arctica Youth Regenerating Cream has been remade into a lighter formula while still maintaining its hydrating, anti-aging appeal. The Haberlea Rhodopensis, also known as “Resurrection Flower,” is the star ingredient that provides intense moisturization along with antioxidant and free-radical scavenger Vitamin E and White Birch, which also limits the degradation of existing Hyaluronic Acid. While glycerin and adenosine help build supple and healthy skin through the reduced appearance of lines and wrinkles. Similar to the Clinique, this oil-free formula is ideal for women with normal to oily skin whom plan on layering some makeup over it. This lightweight, fast absorbing face lotion reduces visible signs of aging and appearance of wrinkles thanks to the Vitamin C and resveratrol, which support the natural collagen. While the hydrolyzed hyaluronic acid provides long-lasting hydration that won’t have your makeup running during a hot summer day. 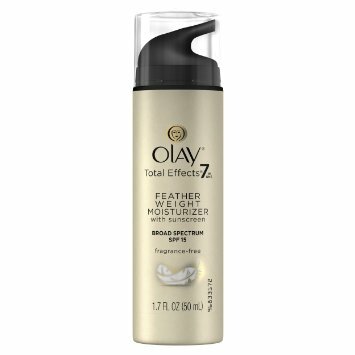 The new Olay moisturizer is the exact type of fast-absorbing, non-greasy formula that we pine on those sweaty summer days. Featuring Vitamin B3 and Glycerin, the formula is full of anti-aging skin benefits such as smoothing lines, enhancing brightness, evening skin tone, reducing the look of pores and restoring firmness. All of this on top of providing protection against UVB and UVA rays thanks to their Olay SolaSheer Technology.